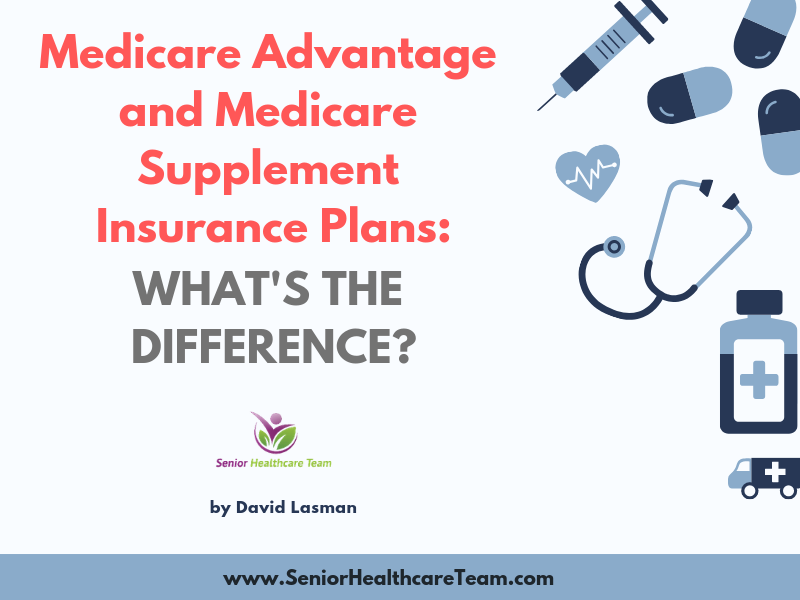 Articles Medicare Advantage and Medicare Supplement Insurance Plans: What’s the Difference? There are different ways that you can receive your Medicare coverage, or add onto that coverage. Medicare Advantage and Medicare Supplement insurance are options that may sound similar, but they’re quite different. They do have one main thing in common: they’re both offered by private insurance companies. Original Medicare, Part A and Part B, is a government health insurance program for those who qualify by age or disability. Part A is hospital insurance, and Part B is medical insurance. There are some out-of-pocket costs associated with Original Medicare, such as copayments, coinsurance, and deductibles. To help with those costs, if you’re enrolled in Original Medicare, you can purchase a Medicare Supplement (Medigap) insurance plan. You generally cannot enroll in both a Medicare Advantage plan and a Medigap plan at the same time. If you have a Medicare Advantage plan, you’re still enrolled in the Medicare program; in fact, you must sign up for Medicare Part A and Part B to be eligible for a Medicare Advantage plan. The Medicare Advantage plan administers your benefits to you. Depending on the plan, Medicare Advantage can offer additional benefits beyond your Part A and Part B benefits, such as routine dental, vision, and hearing services, and even prescription drug coverage. Medical Savings Account (MSA) plans deposit money into a “health-care checking account” that you use to pay for health-care costs before the deductible is met. If you decide to sign up for a Medicare Advantage plan, you may want to shop around, because costs and coverage details are likely to vary. Some of the costs associated with Medicare Advantage might include a monthly premium (not counting your Part B premium, which you must continue to pay as well), annual deductible, coinsurance, and copayments. To be eligible to enroll in a Medicare Advantage plan, you must be enrolled in Original Medicare, reside in the plan’s service area, and (in most cases) not have end-stage renal disease (ESRD). Medicare Supplement insurance, also known as Medigap or MedSup, is also sold through private insurance companies, but it is not comprehensive medical coverage. Instead, Medigap functions as supplemental coverage to Original Medicare. Current Medigap plans don’t include prescription drug coverage. Medigap plans may cover costs like Medicare coinsurance and copayments, deductibles, and emergency medical care while traveling outside of the United States. There are 10 standardized plan types in 47 states, each given a lettered designation (Plan G, for example). Plans of the same letter offer the same benefits regardless of where you purchase your plan. Massachusetts, Minnesota, and Wisconsin offer their own standardized Medigap plans. The standardized Medigap plans each cover certain Medicare out-of-pocket costs to at least some degree. Every Medigap plan covers up to one year of Medicare Part A coinsurance and hospital costs after Medicare benefits are used up. But, for example, Medigap Plan G plans don’t cover your Medicare Part B deductible, while Medigap Plan C plans do. So, if you’d like to enroll in a Medicare Supplement insurance plan, you might want to compare the Medigap policies carefully. While benefits are standardized, the costs are not, meaning they could fluctuate depending on the insurance company offering the plan and location. That is, while Medigap Plan G includes the same coverage no matter where you buy it, the premium for this plan can vary. Also, not every standardized lettered plan is offered in every state. If you decide to sign up for a Medigap policy, a good time to do so is during the Medigap Open Enrollment Period, a six-month period that typically starts the month you turn 65 and have Medicare Part B. If you enroll in a Medigap plan during this period, you can’t be turned down or charged more because of any health conditions. But if you apply for a Medigap plan later on, you may be subject to medical underwriting; your acceptance into a plan isn’t guaranteed. No matter whether you enroll in a Medigap policy or a Medicare Advantage plan, you must continue paying your Part B premium.